Tobacco residues produced from domestic cigarette industry are an abundant biomass resource which have the potential to be exploited and utilized as solid fuel. In the present study, a comprehensive investigation was performed on the fuel properties of hydrochars which were derived from hydrothermal carbonization (HTC) of tobacco residues in the presence of minute amount of graphene oxide (GO). 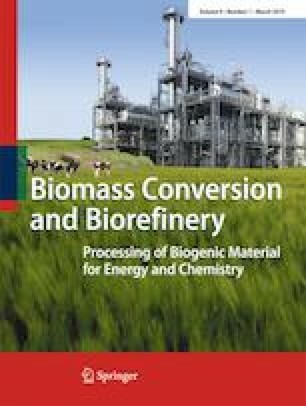 The effect of HTC temperature and residence time on the chemical compositions, structure, and combustion performance of the resultant GO-assisted hydrochars was evaluated. The carbon content and energy densification increased with the hydrothermal treatment intensity accompanying with the decline in hydrogen and oxygen contents. Meanwhile, the combustion behavior of hydrochars was analyzed based on the thermogravimetric curves and isoconversional Kissinger-Akahira-Sunose method. The activation energy varied with conversion degrees for the tested samples, indicating the complexity of hydrochar combustion. Notably, the decreased activation energies for GO-assisted hydrochars may indicate the catalytic role of GO during the combustion process of components in hydrochars. The online version of this article ( https://doi.org/10.1007/s13399-019-00408-2) contains supplementary material, which is available to authorized users. This work was supported by the CNTC’s projects (No. 110201401018), the Key Scientific Research Projects of Henan Province Universities (No. 17B550006), and the Doctoral Research Foundation (No. 2014BSJJ067) of Zhengzhou University of Light Industry.